Feeding time can be somewhat of a wild time at our house. My son loves to throw anything he can get his hands on. Its hard for him to get that we cheer when he throws a baseball or football but we do not want him to throw his plate at dinner time. Hes funny about it too. He waits until I am not looking then throws it! While I was surfing the net I found this product by Lil Diner the Baby Diner. It is a invention that makes it so your child cant pick up there plate or bowl off their high chair. It uses suction cups to keep the bowl or plate stuck. 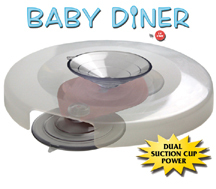 The Baby Diner works on any smooth bottomed plate or bowl and suctions to flat surfaces. I thought now this I have to try! Its a simple item but so useful. He could not with all his might get the bowl off the Baby Diner. And boy did he try! He was a bit mad at first but then gave up and enjoyed his dinner. I can see this is going to be very useful for us, especially as he gets bigger and stronger. My husband was a bit like what is that thing but after being able to enjoy a dinner as a family without a plate tossed on the ground or at us he was glad we had it. I can see bring the Baby Diner with us when we go out to eat. At restaurants he gets really crazy with the plates and most places do not have plastic plates. So him throwing those is nerve wracking. I will definitely be packing in it the baby bag anytime we go out. I think I may need one for the house and on for on the go! Following you back! You must have fun with all these giveaway!